To encourage the highest quality production values, the Mark Time Awards will now be awarded every two years. The next awards will be open for submission in January of 2020. All Mark Time opportunities will be posted on the website.. The Mark Time Awards are given in recognition of the best current audio theatre productions in the genres of science fiction (Mark Time Award), fantasy and horror (The Ogle Award), and mystery/detective (The Danger Prize). 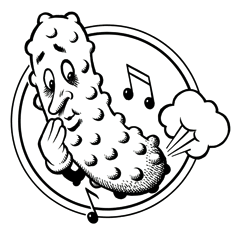 The 2018 competition launches a new category for best comedy—The Squeeky Pickle Prize. The Runyon Award is open to a production in any of the above genre categories, produced by youth under 18. The Betty Jo Award is given to the best acting performance among the winning submissions, at the judges’ discretion and The Bradshaw is given out of competition, for “services to the field,” awarded to an individual or group for outstanding contributions to the accomplishment, the advancement, or the preservation of the spoken audio arts. In its fourth year presenting at the HEAR Now Audio Fiction and Arts Festival in Kansas City, the Mark Time Awards will celebrate its 22nd year of honoring good work in the theatrical audio medium. As a legacy project of the Firesign Theatre, the awards encourage creative use of the audio arts, encompassing skillful use of writing, voice performance, sound effects, acoustic environments, musical elements, and technological tools of the trade. The judging panel is made up of the surviving members of the Firesign Theatre family, the original founders of the Mark Time Awards, previous winners of the awards, and other professionals in the spoken word, broadcast, podcast, and audio arts community. To encourage the highest quality production values, the Mark Time Awards will now be awarded every two years. The next awards will be open for submission in January of 2020. All Mark Time opportunities will be posted on the website. For "service to the field" of audio theater. for Best Acting Performances in audio theater. The Mark Time Awards (www.marktimeawards.org) are given to recognize the producers of audio theatre in the genres of science fiction, mystery/detective, horror, fantasy, and comedy. The awards were founded by Jerry Stearns and Brian Price as part of the preeminent science fiction conventions Minicon and later CON-vergence. The awards originally honored producers in the sci-fi genre only but, over the years, expanded to include the other categories. The awards ceremony moved to the Hear Now Festivals as a presentation venue in 2015 and the administration has been taken over by the Firesign Theatre family as a legacy project to encourage the continuation and development of the audio-driven art form while furthering the education of producers in the field. This year, the awards were particularly competitive with 31 entries from twelve states nationwide and four different countries. They included a binaural production from the UK, the final episode of a twenty-year-long series from South Africa, and a Grand Master Award to local KC-area producer Darrell Brogdon for his comedy series Right Between the Ears. The ceremony was hosted by Firesign’s still-standing members David Ossman and Phil Proctor. Continuing a tradition which began with the origination of the awards, the event included a live performance of an original “radio” play in the Sci-Fi genre, “Dialogue with Martian Trombone,” written by Brian Price and Jerry Stearns. The cast included David Ossman, Philip Proctor, Melinda Peterson, Richard Fish, Donna Postel, and Orson Ossman. Live sound was provided from the Foley table of Tony Brewer, with recorded effects by Jerry Stearns. The trombone player was Johnathan Curtman. The live show was directed by Brian Price with Sound Engineer Renee Pringle at the helm. Alan Gross, “Airship Al”, winner of the 2017 Bradshaw Award. Julia Whelan, for her role as Amanda in Sight Unseen, from Pocket Universe Productions. 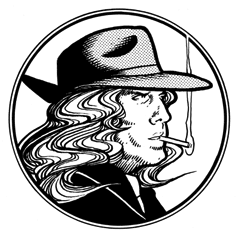 William Stout, the artist who conceived the Firesign Theatre character images used on this website. Matthew Barton, Curator and collector of audio for the Library of Congress, now including the Archives of the Firesign Theatre. Darrell Brogdon, for 32 years as writer and producer of Right Between the Ears, the comedy series on Kansas Public Radio. Dieter Zimmermann, for the seven excellent episodes of the Brad Lansky science fiction series, from Protophonic. The next Mark Time Awards will be held in 2020, so you have two years to write, record and produce your next Audio Theater spectacular show.